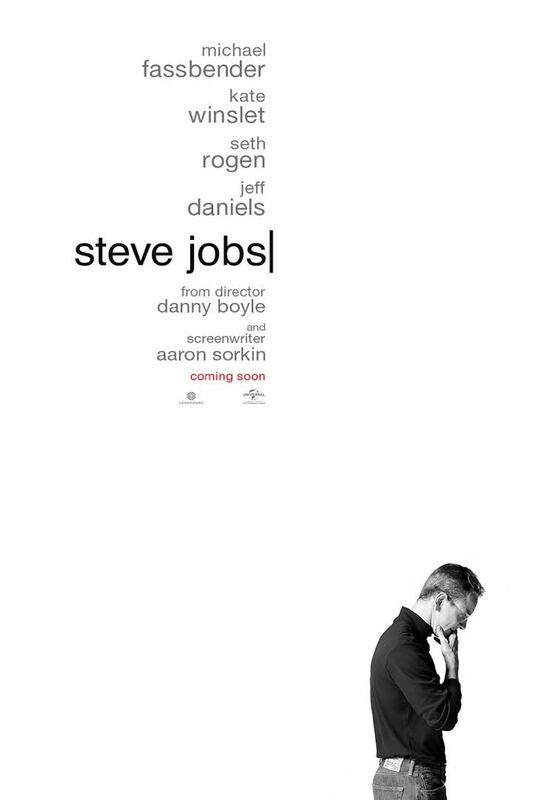 I don’t have much to say about Steve Jobs, which has been playing here in New York in a limited release. This is how I know I didn’t care for it. When you look at the list of people who came together to make the new movie about Steve Jobs, it’s almost impossible to think that the end result could be bad. You’ve got Academy Award Winner Danny Boyle, whose work I’ve enjoyed since Trainspotting. With a track record like 28 Days Later, The Beach, Sunshine, and Slumdog Millionaire, he’s having a wonderful run. You also have Academy Award Winner Aaron Sorkin, fresh off both The Social Network, Moneyball and The Newsroom working the screenplay. With actors like Michael Fassbender (12 Years a Slave, Slow West) and Kate Winslet (Divergent, A Little Chaos) on board , it’s almost like having the stars align. And yet, I almost walked out on Steve Jobs. It just wasn’t for me. Maybe I was just tired. – The launch of the original Macintosh just after the “1984” Super Bowl commercial. – The launch of the NeXt system, which Jobs created after being fired by Apple. – The launch of the first iMac, just after Jobs returned to Apple as the interim CEO. The entire first part was really good, with arguments going back and forth over the ability to get the on stage Mac to say “Hello”. Steve also argues with Chrisann Brennan over the financial support for her daughter, Lisa Nicole. Steve simply won’t admit she is his. When asked about the name of his first computer, Jobs goes to great lengths to explain that the acronym (Local Integrated System Architecture) is just a coincidence. When Lisa amazes him with her computer usage, he decides to support her mom with a check. Every segment after that felt like a repeat of the first one to me, almost like Run Lola Run. In the beginning, it feels fresh, witty, nice. By the end, I was fighting to simply stay awake and care. What I hoped to see was more interaction with Steve and Lisa. If they were so distanced then, and grew close later in life, what was the catalyst? Was it the cancer diagnosis Steve had in the early 2000’s? We’ll never know, because the movie stops just before that time period. Did he suddenly realize that his heart wasn’t as small as the Grinch? What about Jonny Ive, who was responsible for much of Apple’s design after Job’s return? Nope, not even so much a mention. And I think this is the overall problem I have with the film. Yes, Steve Jobs by himself was a visionary, and as the story points out, he conducts the Orchestra, but there’s no reverence whatsoever to any of the other people that helped get Apple where it is. It doesn’t make the movie terrible for not covering these angles, but there are a number of missed opportunities as a result of using such a narrow range. Fassbender was wonderful to watch onscreen, as well as Winslet. One of the odd things is that from a performance standpoint, everyone in Steve Jobs is effective. I wouldn’t be surprised to see Fassbender get some kind of recognition come awards season. Even Seth Rogen did a good job, though his version of Wozniak was limited to constantly arguing for credit like Morrie in Goodfellas looking for his cut of the Luftansa Heist. There are points, however, where the banter just becomes a little too much. Mind you, I loved The Social Network. I enjoyed The Newsroom. A Few Good Men is one of my favorite films. I’ve even seen the man in person once. He knows what he’s doing when it comes to having people talk. Here, it just seemed like Sorkin said…”What if I created a play about how Steve Jobs could be.” and rolled with it. Supposedly, he acknowledged that much of the writing here isn’t entirely accurate. I can accept that, but I think the structure of the film damaged it all for me. I would have preferred more of a straight A-B narrative than what I received. Is that too long to put to screen? Perhaps. Here at the Shattered Lens, Lisa Marie and I have gone head to head regarding Aaron Sorkin, sometimes yelling from our respective offices. She’s not a fan, but I’ve liked his work. The argument is that for all of his abilities when it comes to writing, he doesn’t really handle women well. It’s true. Women haven’t always fared well in Sorkin’s world, and watching Winslet, I was almost sure I could come back here and say in his defense…”Hey, Sorkin wrote a good girl that doesn’t just exist to help the male hero to succeed or as a target for males to pick on. This isn’t Demi Moore in A Few Good Men. Aha! !” I wanted to say that. I really did…but I can’t. As good as Winslet is here, her character is almost Emily Mortimer’s from The Newsroom. She does have some great lines, and her screen time with Fassbender is nice. I did enjoy Danny Boyle’s direction here. The approach with using the different film styles (old style camera work for the 1984 Macintosh launch, conventional film for the NeXt Launch, and HD optics for the iMac release) was interesting, and I liked how he used the environment to tell the story. I have little to complain about there. Note that the audience did applaud the film. There were moments where a phrase or two yielded some laughs. In that sense, maybe the film accomplished something. You’ll have to see it and come to your own conclusions on how it works for you. It just wasn’t for me, and I was really looking forward to it. This entry was posted in Film and tagged Aaron Sorkin, Apple Computer, Danny Boyle, Jeff Daniels, Kate Winslet, Leonard Wilson, Michael Fassbender, Seth Rogen, Steve Jobs. Bookmark the permalink.